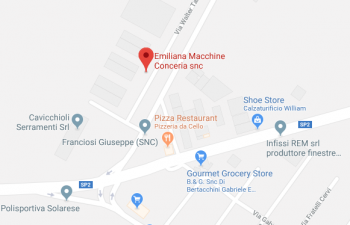 I trattamenti connessi ai servizi web di questo sito hanno luogo presso EMILIANA MACCHINE CONCERIA DI CAVALLINI ENEA & C. SNC, e sono curati solo da personale incaricato del trattamento, oppure da eventuali incaricati di occasionali operazioni di manutenzione. Social Sharing – Third party cookies to allow you to share content directly on the social networking/sharing sites like Facebook, Twitter or Google+. Examples would be if you wanted to “like” or “tweet” about us or our products or services. Please see our “Third Party Cookies” section below for more details. Third-party cookies, are used by third parties to display personalized advertising on our site or on other websites. Commercial cookies may also be used by third parties to show their products and services on our site. Anyone can ask to be removed from tracking profiling or third-party cookies. Below are the ways to disable cookies for the most commonly used browsers. For the cookies settings in browsers, reference should be made to the informational documentation prepared by the browser manufacturer. -In the section “Accept cookies” specify whether to accept cookies always, never or only from the sites visited. ATTENTION: By continuing to browse our site, you implicitly accept the cookies that the system will install.